Hello! My name is Annalyse Moncrief and I am excited to be sharing some of my work with you today! I am currently a student at Watkins College where I study photography. This past semester, I have been lucky to be able to intern with Katie. It has been an amazing experience. I have learned so much, both about book arts and the ins and outs of being an artist and a business owner. I first fell in love with book arts in a class offered through Watkins. Since then, I can't get enough. I was thrilled to find Katie's internship and couldn't believe that I was lucky enough to get to work with her this semester. I thought I'd take a moment to share all the things I've been making as part of this experience. On my very first day, we made the journal that I have been using to keep track of my experiences in my internship. It's a leather bound Italian Long Stitch journal that I have been filling with all the awesome things I've been learning about. Next I got to sit in on a French Link Stitch workshop that Katie taught at the Nashville Public Library. We were making small sketchbooks filled with all sorts of recycled and reclaimed papers to serve as inspiration! The covers and guards were made of wallpaper samples that make for a nice, rugged protector for the sketchbook. Inside I used a wide assortment of papers from paint chips and old maps to sewing patterns, and even some old handmade paper! My favorite part of the process was getting to arrange all my scraps into my book and getting to see all the fun things the other people in the workshop were doing. I finished mine with a button and a length of sting as a fastener. Next, I learned the Secret Belgian binding. I love this one because of the pattern the thread makes across the covers and the spine. It the cover also flips all the way around the spine, which makes the journal perfect for sketching on the go. For my second lesson, I was curious about a multi-needle Coptic. I like this process because it creates a beautiful multi-colored pattern along the spine. I chose to do mine in blues, greens, and browns so that it would match the research I am planning use it for. One of my upcoming projects is on river systems and this will be the perfect place to keep all my notes! I also got to help make several kinds of ornament books. We started with the hardcover star ornaments. These little books open up to make paper stars. They are super cute and look really nice hanging on the Christmas tree this year! I also got to help with some small leather ornament books. These little guys are functioning journals, just in miniature size. For these, I learned how to do a chain stitch that looks really nice along the spine and will come in handy later. For my last project, we worked on something a little different. 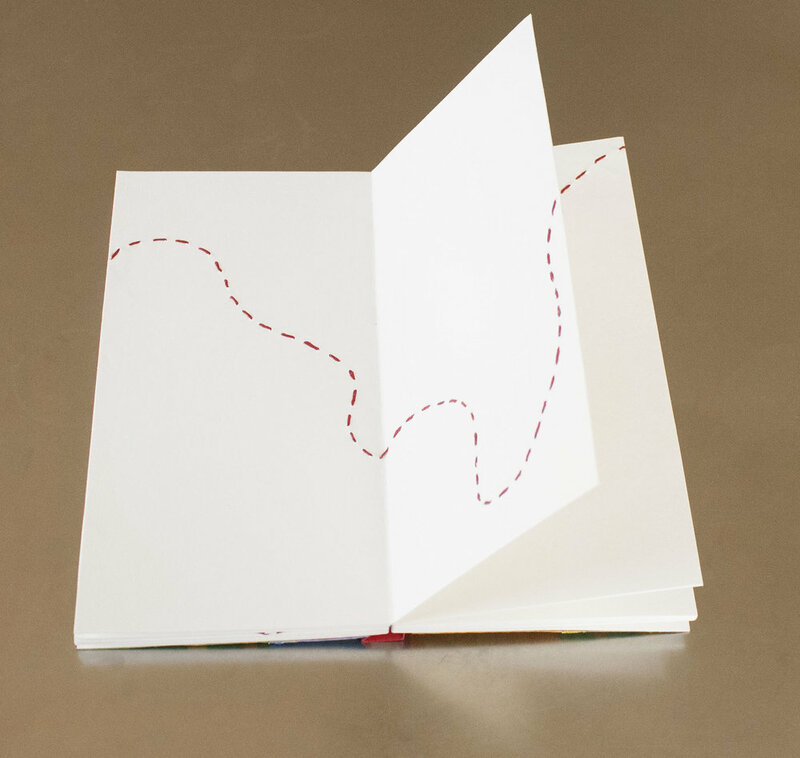 I wanted to make a book that I could stitch into and have a continuous line running throughout the book, but I didn't want to use an accordion fold. Katie suggested a drum leaf binding. This type of binding worked really well because I could design the spreads and then glue them together, without worrying about the reverse side of my pages. It took a lot of precise measuring and cutting, but it was worth it in the end. I also brought in a quilt top I had stitched together and Katie showed me how to back it so that I could use it on my cover. Hello everyone, my name is Shannon Rutherford and I am back again today with another guest post here on the linenlaid&felt blog. 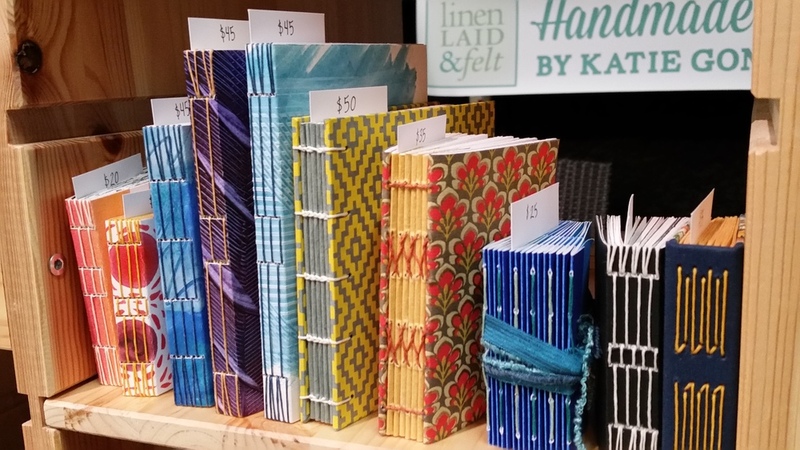 As part of my bookbinding internship, Katie invited me to come along with her to the 2016 Porter Flea Summer Market this past weekend. Today I’ll be telling you all about my experience with helping Katie at her booth at Porter Flea, as well as my overall impressions of the event and images of my favorite vendors. Since I recently moved to Tennessee, this was my first time ever attending a Porter Flea event. I was very excited for the opportunity to get to help Katie and see the process of how she prepares for an upcoming show. 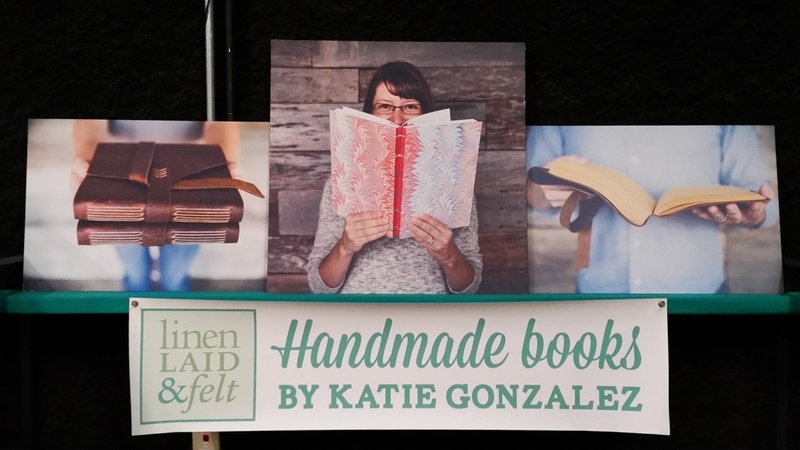 I started out by helping Katie promote her handmade books on social media through her Instagram account. In the days leading up to the event, I helped Katie resize photos and write captions for posts to get the word out about her booth using the hashtags #pfsummer16 and #porterflea. On the day of the event, we loaded up her car and drove over to the venue. This year the event took place at Skyway Studios in East Nashville. Upon arriving, we entered through a long hallway that split off in either direction. The first thing I noticed was a giant green floor in the center of the room. I later learned that it is used in combination with a green screen for TV production and filming projects. Soon we began setting up Katie’s display and arranging her books on the table in the booth area. I quickly noticed and appreciated how much attention to detail and effort Katie puts into her booth display. She had lovely photographs of her work on display behind the booth, and her branding and signage was very clearly laid out and labeled neatly. Once the setup was complete, all of her handmade books looked so bright and colorful when presented as a whole. Here are some photos of the final booth display before the event began. I was really impressed with how everything came together and it was fun to see an ordinary table be transformed into such a unique and eye-catching display. As the preview night began, I was able to see the procedure of how one makes a purchase of Katie’s books and how Katie collects payment using an app called Register. It is a really quick way to process payments and has many great features including the ability to upload images of your products right into the app. I couldn’t believe how easy the technology was to use! Once the setup was complete, we went into the vendor lounge for pizza. I got to meet some really lovely artists and hear all about their work. It was such a supportive environment where all the vendors were really friendly, rooting for each other’s success and wishing each other good luck. Other vendors began trickling in one by one and also completing their booth setup for the day. At 6 p.m. the preview party began. It was a great concept to allow people to be the first to enjoy the show without having to wait in a long line. Many people showed up and wandered through the venue, which was very spacious. I helped Katie greet people as they approached the booth, as well as answering questions about her products and handing out information about her upcoming classes. It was really fun to interact with people and see their faces light up when they saw Katie’s books and to see their appreciation when they learned that she made all of them by hand. I had a great time meeting some of the other vendors that Katie introduced me to as well. It was a great place to network and meet other artists and ask them more in depth questions about their artistic process and inspiration. Throughout the day, Katie and I both had the opportunity to walk around and see the other booths in the show. I was very impressed with all of the work and really loved seeing the variety in the work displayed. It was by far the best show I have been to since moving to Nashville and I will definitely be attending in the future. Bean & Bailey Ceramics was the booth across from ours and it immediately caught my eye. I love all of the pastel colors and simple shapes. I also really enjoyed speaking with the vendor about his process. This Loves That was one of my favorites! I really loved the non-traditional materials she used in her jewelry. She used fun, clean geometric shapes in her wooden jewelry and her work was very colorful and playful. She also had these neat little pouches with simple designs featured below. I really loved how Porter Flea highlighted printmaking and illustration. I bought this print from Camp Nevernice as an early birthday present for my twin sister who loves typography, music and singing. I learned later the next day that she had picked out the exact same print to show me. 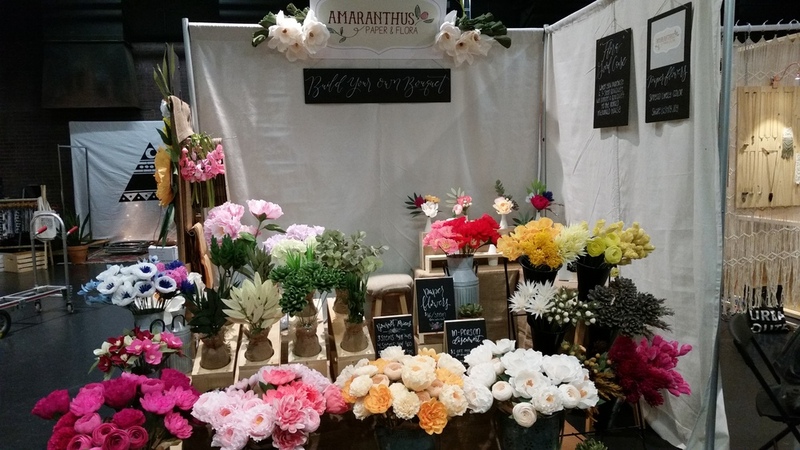 I was lucky to have met the owners of Amaranthus Paper & Flora, a mother and daughter team. Their work is so intricate and stunning; it had me doing a double take as I initially thought their flowers were real and not paper. What a wonderful idea to bring joy to people, especially to those who are sick and may not be able to receive real flowers due to risk of infection in hospitals. They are spreading joy and I love that concept. The Peppered Paper booth was filled with detailed, beautiful prints. I really loved how she had a framed original so you could see her process. The finished prints contain very delicate, fine lines but catch your eye with their bold color. The attention to detail is just amazing! My overall impression of the event was great and I loved seeing the unique works of each artist. I really enjoyed collecting all of the business cards from the show. It was a good learning experience and introduction into how to market and sell your products to people and engage with your buying audience. Katie is a pro at it and is always very helpful to others. You can walk away from Katie’s booth having learned something new and her passion for her work is evident in how she carries herself and expresses her creativity. I can't wait to attend another Porter Flea event in the future! My name is Shannon Rutherford and I am excited to be a guest writer today on the linenlaid&felt blog. I’m an artist from Arizona and moved to Tennessee in March to pursue my passion for the arts. I graduated with my BFA in Studio Arts from Santa Fe University of Art and Design in Santa Fe, New Mexico. My work combines abstract design and bold colors to form visual puzzles of interlocking shapes and lines. I often incorporate traditional hand-drawing with collage, and enjoy experimenting with digital vector art as well. For the past month I’ve had the opportunity to work with Katie as her bookbinding intern. It has been a great experience getting to know Katie and to see her artistic process. I’d like to share what I have learned and the books I have created so far. In total, I have made 12 books by hand and I’m excited to show you the results. My first introduction to bookbinding came from taking Katie’s workshop at the Nashville Public Library. I met some lovely people in this workshop and enjoyed seeing each person’s creativity shine through in their books. It was a great experience helping Katie setup for this workshop and to see behind the scenes of how she prepares for her classes. Katie’s teaching style made it easy and comfortable to learn at your own pace and it was a fun way to kick off this internship. 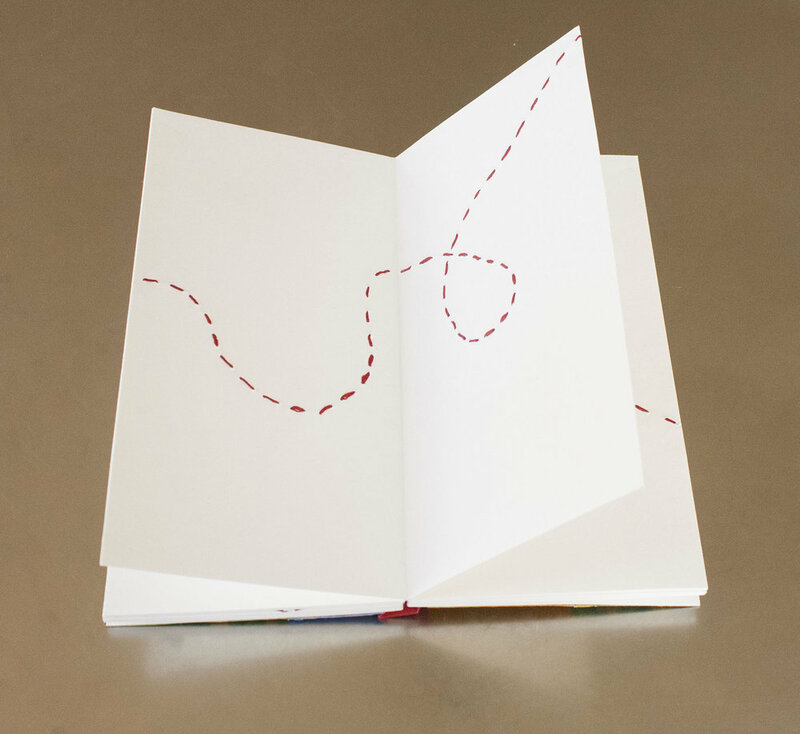 The book we made in this workshop features the French Link Stitch along the book’s spine. Inside, I used pages of old sheet music, fashion illustrations, and parts of old maps. Next, I constructed three smaller books made from folded papers — with minimal cutting and gluing of the materials. 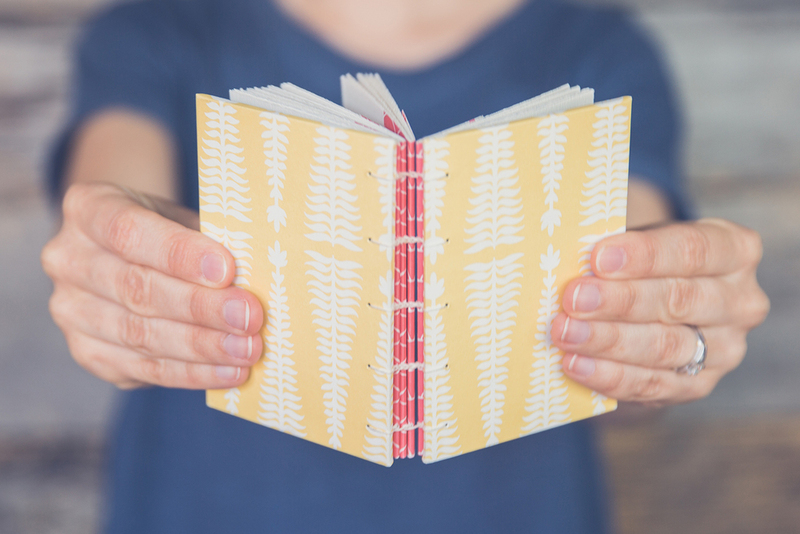 This mini accordion book opens up and can be hung as a lovely decoration. Not only are they cute to look at but they were also so much fun to make! We also made this mini book that opens up and can be displayed during the holidays as a colorful paper ornament. I helped Katie by following her instructions step-by-step and giving her feedback. This was to help test a prototype of a new bookbinding kit that Katie has in the works. The next book I crafted was a pop-up book with hard covers. I got to experiment with different cuts in the paper to create interesting shapes. I also love this Japanese cherry blossom paper. One of my favorite parts before beginning a new book is picking from Katie’s paper collection. Her studio is filled with a wide variety of colorful papers to choose from. I particularly love her hand-made papers which are vibrant in color and rougher in texture. She also has decorative papers with patterns and bold designs. It definitely makes deciding on which paper to use that much harder because they’re all so great! We then made a beautiful leather-bound journal using the Italian Long Stitch binding that can be seen along the spine of the book. This next book has been my favorite by far and it is because of the Secret Belgian Binding style. This book looks like a typical hardcover book until you open it. The front cover actually swivels backward until the front and back cover are touching. It makes for a sturdy and functional book with a flat surface perfect for drawing or writing. I also learned how to make small and large pamphlet books, which are handy. They also allow the artist to use the same stitch in a variety of ways. Most recently I learned four types of Japanese stab binding. We used the hemp leaf, noble, tortoise shell, and 4-hole binding styles to make these small books. All of these bindings are versatile and can be adapted to fit both small and large book formats. So there you have it! I hope you’ve enjoyed seeing what the internship is yielding so far. Not only am I getting a behind-the-scenes look at Katie’s process, I’m also gaining valuable knowledge about what it takes to be a professional artist. Katie has been a great resource. It’s inspiring to see her passion for her craft. 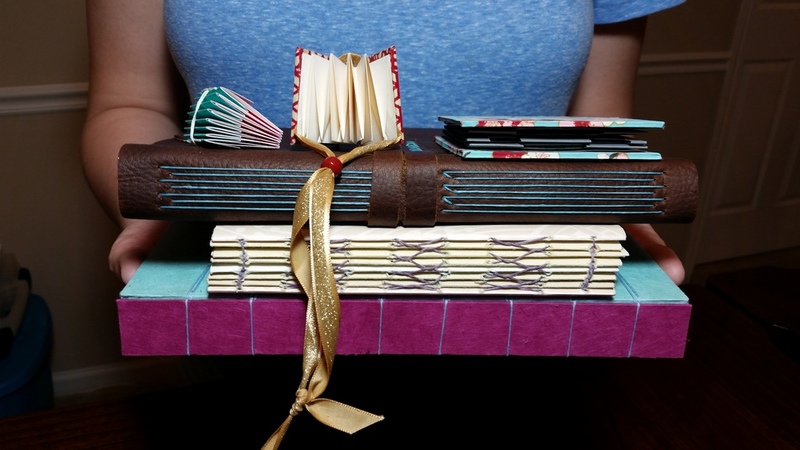 She has opened my eyes to the wonderful world of bookbinding and I can’t wait to see what we’ll create next! To learn more about Shannon’s work, please visit her website, online shop, or Instagram. When I decided to host a handmade book giveaway, I was flooded with comments on Instagram and Facebook, each sharing an idea for how this book could be put to use. I enjoyed reading everyone's creative and meaningful ideas, and it was difficult to choose a winner. "I'm newly engaged at 37 years old. My fiancé and I have been together for almost two years and plan to marry this October. We would fill these pages together as our bedside communication journal. Anytime either of us has something to share with the other that can be more easily expressed in writing we would write an honest note and leave it on his/her nightstand. Perhaps some pages would be filled with prayers for one another... or confessions of difficulty in one area or another... or invitations to make love... or words of affirmation... or concerns... or love poems... or honey-do-lists!! 💛"
Congratulations, Shawn! I hope you and your fiancé will enjoy filling this book with messages. And I wish you both all the best in your lives together. For more creative ideas about how you could fill a book of your own, check out the #myusedbook campaign and this gallery of books in action. Our dear friends Amy and Drew celebrate their one year wedding anniversary today. This time last year, my husband Tony and I headed up to Chicago for their big day. Tony and Drew have been best friends since middle school, and Tony was the best man in their wedding (just as Drew was the best man when Tony and I tied the knot). For my contribution to the festivities I created a custom wedding guest book, which was filled with Polaroid pictures and messages from guests. I made a handbound hardcover guest book with landscape-format pages. Amy and Drew wanted each page to be large enough to hold a Polaroid photo and a handwritten message. The book was displayed on a large wooden table near the entrance of their wedding venue. Several Polaroid cameras and a box to hold the photos as they developed sat along side the guest book. And the table decor was completed with an awesome print from Hatch Show Print that they picked up on one of their trips to visit us in Nashville. Amy and Drew picked out some great film from The Impossible Project that had golden, rounded edges. The photos really looked great against the textured, light gray pages and the black photo corners. They requested a minimalist design for the covers — black bookcloth paired with black handmade paper and black thread for the exposed binding — so the photos inside the book would be the focal point. I don't often get to see exactly how my handmade books are put to use once they leave my studio. But I love it when I get the chance. I really enjoyed seeing guests interact with the book and pose for pictures at the wedding, as well as writing in the book myself. And when Drew and Amy came to visit us in Nashville again earlier this month, they brought their guest book with them. I had the chance to flip through the finished book, filled to the brim with photos and congratulatory messages. There's nothing better for me than to see one of my blank books transformed into a treasured keepsake, and I was honored to be able to create such a book for my friends. To see more examples of how my handmade books have been filled and enjoyed, check out the inspiration page on my website or explore the #myusedbook hashtag on social media. Enter to win a handmade book! As you probably know, I’m passionate about the way books can be used to enrich our lives, which is why I created the #myusedbook campaign to showcase books in action. And now I've decided to give away one of my handmade books to someone who has a creative idea for how they'd use it. So to win this little Coptic bound book, please post a comment on either Facebook or Instagram that explains your idea for how you would fill this book in a meaningful or creative way. I’ll choose a winner on May 31 based on the idea that’s most inspiring. And I’ll hope that the recipient will share photos of how they put this book to use. I can't wait to hear all of your clever ideas for how you would fill this book. And best of luck to you! I'm seeking an intern to join my bookbinding studio. I'm passionate about teaching, as well as binding books, and I'd like share my skills with a young artist who wants to bind books by hand and learn what it takes to run a creative business. Interested? Learn more about the internship here, and then submit your application! The internship will be based out of my home studio in Nashville, Tennessee, and the dates of the internship are flexible in terms of length, start and end dates, and daily schedule. If you're ready to apply, you can submit your application here. And if you have any questions, please don't hesitate to send me an e-mail. Over the past year, the linenlaid&felt studio has been a busy place. I've been working on new projects, experimenting with new ideas, and learning new techniques. And while I've spent lots of time making, I've spent less time blogging. But I'm aiming to change that, because I just have so much to share. Embroidery sampler on handmade paper by Claudia Lee. I teach several bookbinding classes and workshops each semester in Nashville, but I've also decided to take more classes myself. Over the past year, I've brushed up on my papermaking skills, tried my hand at making marbled paper, learned some traditional bookbinding techniques, and made handmade paper boxes. Each of these classes have helped to give me a new perspective on my work, and I plan to write about them all in more detail. But for now, I want to start off with the most recent workshop that I took. A work-in-progress: The handmade paper box I made during Claudia Lee's workshop. I recently spent a weekend with Claudia Lee learning to make an elaborate box out of handmade paper. Working with materials I use on a daily basis — handmade paper and waxed linen thread — I made something quite different. My box (once it's complete) will be a place to store all of my bookbinding tools, elaborately decorated with embroidery and collage. Despite an entire weekend of stitching, my handmade box is still a work in progress. But I truly enjoyed the process of selecting color schemes, creating small compositions on each panel, and hand-sewing detailed patterns. Each surface of the box (including the bottom and the inside), is embellished with some sort stitching or design. It's a time-intensive, detail-oriented, and tedious undertaking — which happens to be right up my alley. Handmade paper boxes by Claudia Lee. At the end of the workshop, I felt invigorated, inspired, and creatively refreshed. And really, what could be better than that?